Notre Dame sophomore Jackson Clark had a team high 17 points in the Titans home opening loss to Western Friday night. PORTSMOUTH – When you run into a hot shooting team, there’s little you can do to stop them, let alone slow them down. That’s exactly what happened to the Notre Dame Titans on their home court in their season opening game against Western. Western shot the ball extremely well in the first three quarters, well enough to sink 10 threes in the game’s first 24 minutes to hold a 46-24 lead over the Titans. Despite the 22 point deficit, the Titans never quit on their home court as they came out of the third quarter break firing and at one point cutting their deficit to just 12. Leading the Titans in scoring was Jackson Clark who had a team high 17 points while also grabbing 6 rebounds and going 4/4 from the foul line, and also Mader’s son, Ben, who had 14 points on 4/6 shooting from behind the arc. 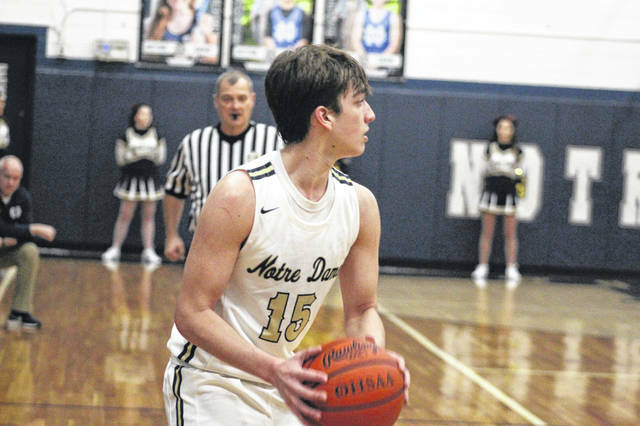 Notre Dame will have a quick turnaround when they will travel to Raceland (Ky.) to take on the Rams in an inter-state battle, one that Mader is hoping to be able take some positives from tonight’s contest and carry them over into Saturday night.